VAC CLEANERS SALES & SERVICE/JAN. EQUIP. & SUPP. If it's not dependable, we won't sell it has been our motto since we opened our doors. 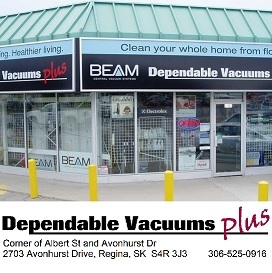 We carry central vacuum systems; portable & upright vacuum cleaners; commercial portable & upright systems. Find us on Albert Street at Avonhurst Drive in the Towers Mall.